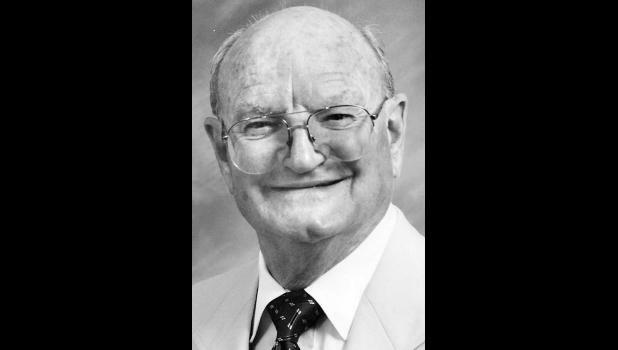 Roy Glenmore Oliver Jr., 88, Holton, died Friday, Nov. 21, 2014, at Medicalodges Jackson County. He was born Sept. 24, 1926, in Shelbyville, Ky., the son of Roy Glenmore Oliver Sr. and Lillian Martin Oliver. He graduated from Hammond High School in Indiana and from Indiana University, receiving a bachelor’s degree in accounting. Mr. Oliver was drafted into the U.S. Navy, serving during World War II. He was vice president of Taylor Chain in Indiana and owned and operated Tastee Freeze and various car washes in Arizona. He had lived in Indiana until 1972. He lived in Arizona from 1972 to 2003, then retired and moved to Netawaka. He was a member of Shriners International. He married LaDonna Moore on Aug. 7, 1965, in Hammond, Ind. She survives. Other survivors include a daughter, LaDonna Reiff and husband Dan, Netawaka; and two grandchildren, Jonathan and Stephanie. Funeral services will be held at 10 a.m. Wednesday at Mercer Funeral Home in Holton. Burial will follow in Pleasant Grove Cemetery north of Holton. Family will greet friends one hour prior to service time. Memorials may be given to Shriners Children’s Hospital, sent in care of Mercer Funeral Home, P.O. Box 270, Holton, KS 66436.